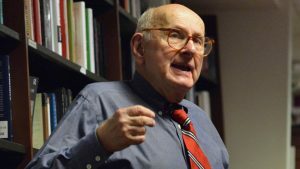 Arnold Offner, Cornelia F. Hugel Professor of History Emeritus, recently wrote an op-ed for the Washington Post, urging Democrats to follow the example of former Presidential candidate Hubert Humphrey. Offner, author of the book Hubert Humphrey: The Conscience of the Country, explains why the former senator from Minnesota, vice president, and 1969 Democratic presidential nominee should be a role model for current political leaders. Despite not being successful in his presidential bid, Humphrey, he explains, was a successful lawmaker who was highly respected for remaining committed to his positions. Read Offer’s piece in the Washington Post. It is impossible not to respect Humphrey for his legislative accomplishments (with a heavy nod to Lyndon Johnson’s influence in 1964 and 1965). It is also impossible not to detest him still for supporting the Vietnam War in 1968 as a candidate who backed into the Democratic nomination after the RFK assassination. The American public was turning against the War and reaching for a peace candidate. Instead they got HHH who gave us Richard Nixon. At a critical juncture, Humphrey sold out.